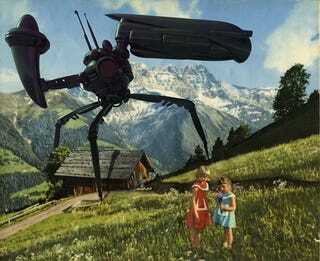 Artist Franco Brambilla combines combines vintage postcards with computer-generated images of aliens, flying saucers, and giant robots, to give your next alien invasion the same quaint, cozy feeling as your grandpa's Alpine vacation. A frequent science fiction novel cover artist, Brambilla's Invading the Vintage series uses actual postcards from Switzerland, Santa Barbara, Milan, and a host of other popular vacation spots. Far from being horrified, the humanoid (and sometimes canine) subjects of these photos treat their alien encounters as just another tourist attraction.